Obviously the best time to load up on stocks is when their prices are the most expensive in history by the most reliable long-term measures. And when half, yes half, of the SP500 corporation bonds are rated one notch above junk thanks to their debt binge to buy back their own stocks and run their stock prices along with the indexes. My broken record on the lifecycle funds are they are based on 1970’s portfolio theories that think all you have to do to lower risk is reduce volatility of the portfolio and NOT reduce the chances of large losses. These marketing models are oblivious to things like valuations, monetary policy and trends. Factoring in real-world factors would take work and the point of these marketing models was to keep people invested all the time and paying their obligatory fees to the portfolio managers. “See everyone else is doing it” marketing. So it is not surprising that TSP mentioned other life cycle funds as having much higher stock allocations (and fees) as an excuse to loading up too. Now TSP is not about earning higher fees and that is a good thing. But come on, those low fees are nothing compared to losing 50% of your retirement in the next run-of-the-mill bear market. Yes, 50% if the SP500 merely reverts back to its highest ever bear market low valuation which occurred in 2003. If it reverts back to its bear market low 2009 valuation which matched the SP500 60-year mean valuation then it needs to lose 60%. Dr. Hussman’s chart below gives us a 90 year look at valuation levels relative to adjusted earnings. So yeah, a great time to load up on stocks. So what are the Lifecycle funds exiting in order to load up on the stock funds – the TSP G fund. So while the TSP G fund was hitting record low interest rates thanks to central bank financial repression monetary policies, the Lifecycle funds were okay with them. Now that the TSP G fund is climbing through 3% interest on its way to closer to 5%, the TSP administrators are going to bail. Nice. If this is all a surprise to you then you haven’t been following us and you have a little catching up to do. Please start with the 3 Lifecycle Issues if you are a Lifecycle kind of investor. And definitely review TSP Charts: About those Valuations where we look at the small cap stock valuations too (TSP S fund). 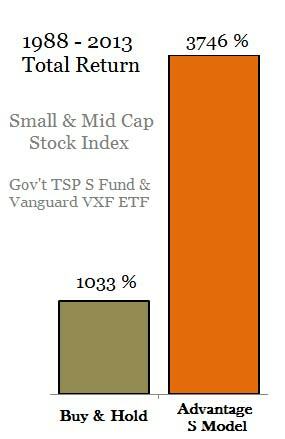 TSP & Vanguard Smart Investor does not want TSP or any retirement account holder to shoulder Wall Street losses. These losses are baked into the markets. Our risk indicators are still signaling “not yet” but we feel they will flip by the end of 2019 if not in 2018.